Obama really is in that grand Democratic tradition, no? Meanwhile, if there’s any silver lining to this, it’s that that pressure on the Democrats and Obama to cut spending and reform entitlements to cut spending will increase to “agony” levels. Not that I expect them to cave in — nope. We’ll see calls for “more revenue” (higher taxes) and more class warfare, more blaming of Republicans and the Tea Party for demanding radical, extremist measures like —gasp!— fiscal responsibility, and more refusal by the Democrats(3) do to anything meaningful, because to do that would be to admit the intellectual bankruptcy and fraud of 80 years of Party orthodoxy. No, real reform and the repairing of our finances has to wait for January, 2013, to begin, which means we all have to work as we never have before to make sure the right (as in “Right”) candidates win in 2012. The S&P downgrade was the alarm saying the wheels are coming off that cart; it’s up to us to bring it to a halt before they do. LINKS: Two thoughtful pieces from Ed Morrissey. First, on the possible effects of a national credit downgrade: Life After D-Day. The other is about how we best get out of this mess: Can We Grow Our Way Out? (1) While I sympathize with my friends on the hard Right (or, as I call that faction, the “Stalwarts”), saying that the downgrade could have been avoided if only we had passed “Cut, Cap, & Balance” (and thus blaming Boehner, too) is to engage in fantasy. In my opinion, it would never have gotten past the Senate and the Oval Office — the latter being held by a rigid, in his heart of hearts Socialist, ideologue. But, even if it could have been forced through, the Herculean effort needed would have taken so long that we’d have been downgraded by now, anyway. The damage done by the progressive sending binge has been that bad. (2) Albeit a grim, resentful one. But a chuckle, nonetheless. 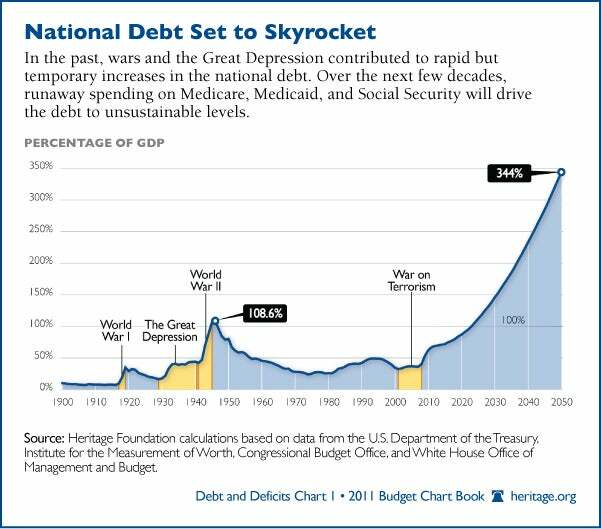 (3) I’m harping on the Democrats because, while I agree with my “Big L” libertarian friends that the Republicans bear their share of the blame for the debt/entitlement/spending fiasco, the lion’s share belongs to the Jackass Party. 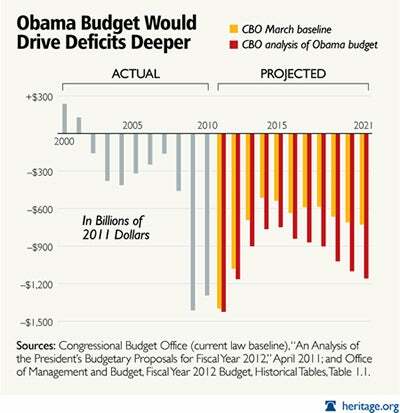 Just look at these charts on the deficit and the debt.